Ralph Daykin, a Gunnerside clock and watch repairer, wrote this letter early in the New Year of 1872 to his brother Joseph who had emigrated to the United States. Ralph mentions some previous correspondence from America which he received in less than 16 days. 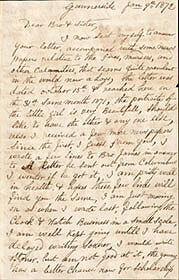 He also tells Joseph that he received a letter from their brother James, sent from Columbus. Another brother, John, had died in March 1871 in Shildon, County Durham and Ralph explains that he hasn't heard from John's family. An earth tremor seems to have struck the Gunnerside area one night while Ralph was in bed and he thought 'the house was Coming down, it threw me up in bed'. Ralph also tells Joseph 'there has been a good Deal of Sickness in the place' with a 'touch of Typhus fever up the dale'.